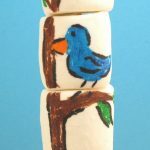 Here are some super-easy marshmallow decorating ideas for last-minute New Year’s Eve treats. 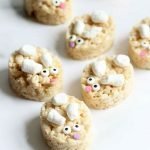 Did I mention how super-easy and last-minute these are? New Year’s Eve marshmallows are easy. All you need are some edible writers and some sprinkles. And some marshmallows and lollipop sticks, too. 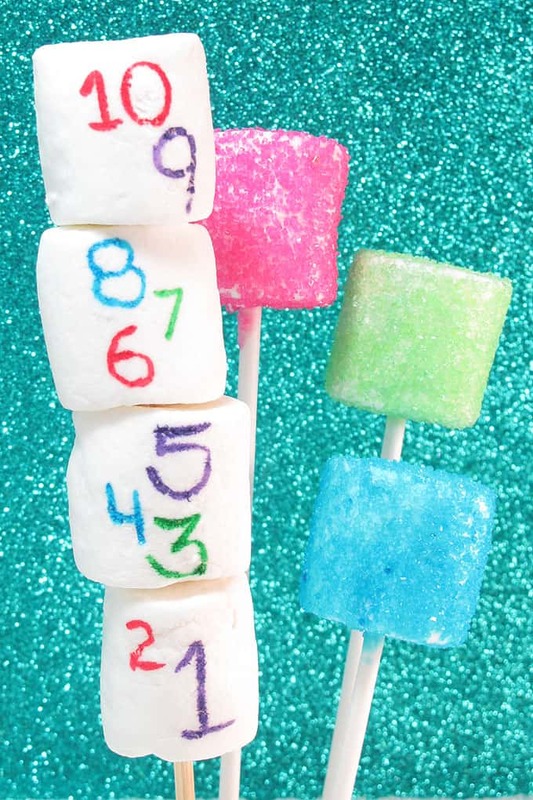 Choose to make simple countdown marshmallows stacked on a stick, or these sparkly, glittery, awesome sprinkle-coated marshmallow pops. 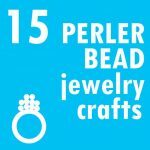 Arrange them in a bouquet for a centerpiece, or wrap them in cellophane bags with ribbon for a New Year’s Eve party favor idea. 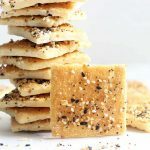 Need more New Year’s Eve treat ideas?? I also love these gold marshmallow pops. And these ball-drop marshmallow pops. 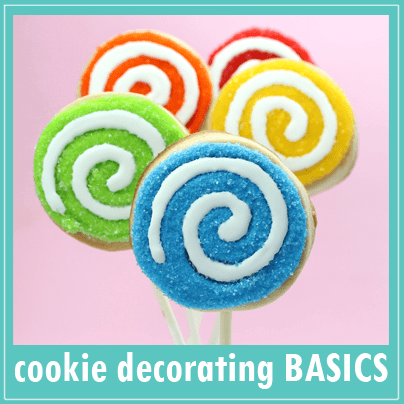 If cookies are your thing, try these countdown cookie sticks or almost midnight clock cookies. 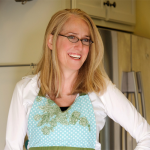 *I use Americolor gourmet writers. You can find substitutes in the craft store. 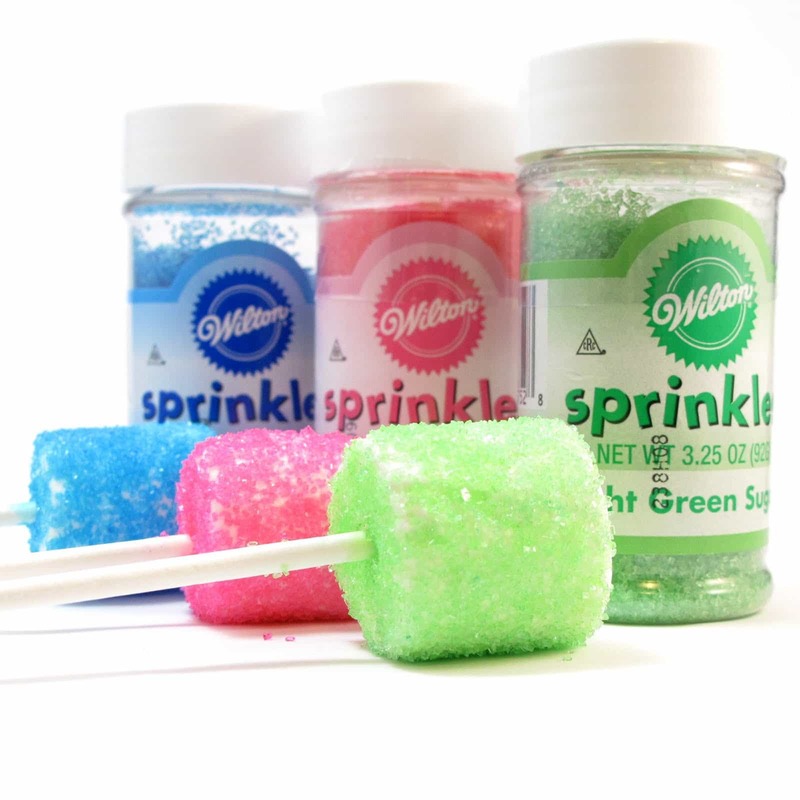 You can also find a good variety of different colored sprinkles in the craft store. Choose fine sprinkles for an extra glittery effect. 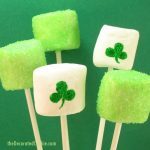 Skewer marshmallows or put on lollipop sticks. 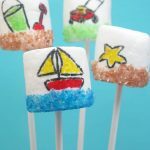 Working with one marshmallow at a time, very quickly dip a marshmallow into the water, remove immediately, blot on a paper towel and immediately sprinkle with the sprinkles to coat. Let dry. For the countdown, skewer a few marshmallows. 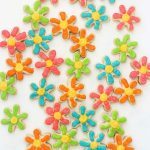 Simply write the countdown with the edible pens. 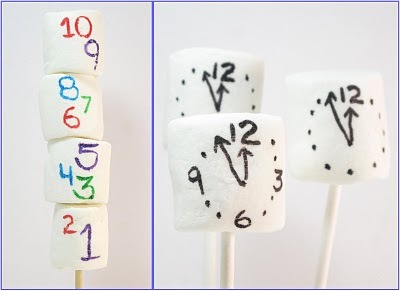 For the clocks, skewer a marshmallow or put on a lollipop stick. 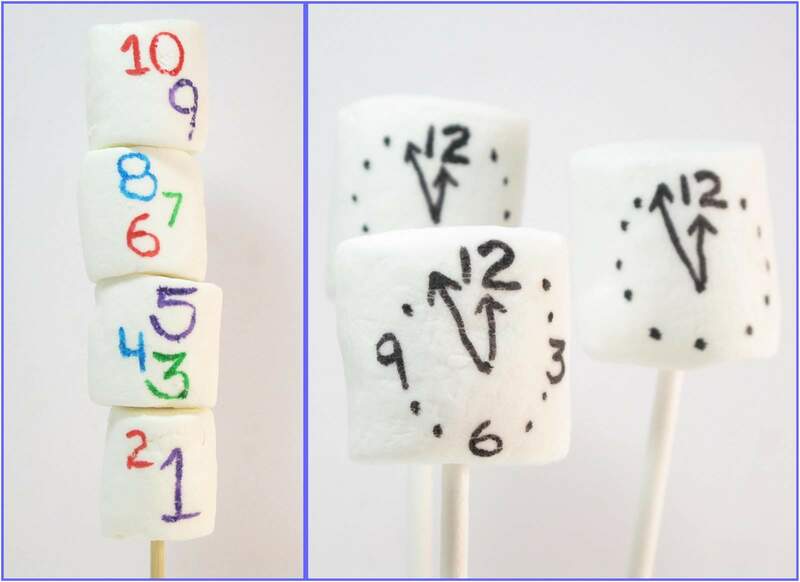 Draw an almost-midnight clock face on the marshmallow. Your pictures are gorgeous! 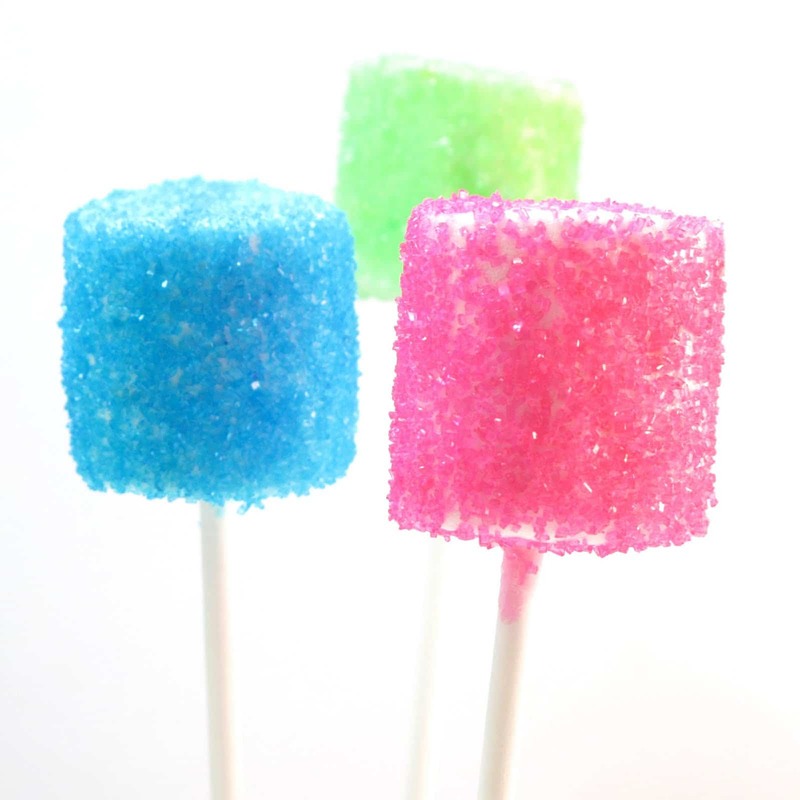 And the sparkly marshmallows are such a cute idea for New Year's Eve! Awesome. 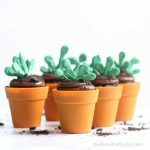 If only I had seen these about 3 hours ago when I was hunting for a super awesome and super easy thing to do with the kids for the party tonight. Oh my! I so wish I saw these yesterday. You are the best and do you know that you make me smile every time you post? 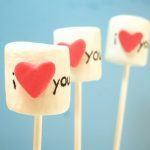 I love these marshmallows.. I am thinking they would be fun for almost any holiday.. I can see red and pink ones for valentines.. and pastels for easter.. red and blue with white sparkle ones for 4th of july… hmm ohhh they are perfect for pumpkins for halloween.. some with sparkles and some with faces drawn on them… wonderful fun idea.. thank you for sharing. oh, you people are the best. I love the idea of a marshmallow necklace… though watch out for bees! Dang, I should've posted earlier 🙂 Aww, Jennifer, you always make me blush with your way kind words! I wish you lived in my house and gave me a nice ego boost every morning before I started my day. oooh, definitely for any holiday. I thought the same thing! !